When Nickelodeon first launched in 1977, it seemed like little more than a child's answer to Saturday Night Live and MTV. In fact, it wasn't until Nickelodeon debuted the Canadian sketch series You Can't Do That on Television in the U.S. that this nascent network began to gain real traction amongst fans of all ages. Before too long, the basic cable channel became quite popular, especially with the launch of it's Nick At Nite line-up featuring such "classic" shows as ALF, The Facts of Life, Growing Pains and many others throughout the years. Viewership certainly proceeded to explode, turning it into one of today's favorite hubs for nostalgia of all kinds. Nickelodeon had officially arrived in the 1990s, taking its signature brand to the big screen with Nickelodeon Movies in 1995. It wasn't until 1997, though, that this film division made its most iconic and beloved movie of all time: Good Burger. Based on a sketch of the same name from the comedy series All That, this lighthearted adventure was directed by television veteran and Head of the Class star Brian Robbins. 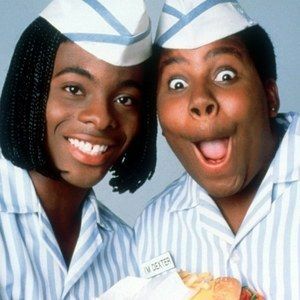 It followed Ed (Kel Mitchell) and Dexter (Kenan Thompson), two lovable if not moronic teenagers forced to save their favorite fast food joint, and place of employment, Good Burger, which is being threatened by a new burger empire opening directly across the street. Made for less than $9 million dollars, Good Burger grilled up nearly $24 million when it was released in the U.S. on July 25, 1997. Eventually it would hit cable and home video, and with Nickelodeon able to keep it playing through its television arm, this film would go on to attain a cult-like status amongst today's adults who remember the movie fondly. We at MovieWeb are nothing if not nostalgic ourselves. We love knowing what happened to the actors and actresses that make up the films we all love. So sit back and get ready to find out more about the exploits behind the cast of Good Burger as they were then and now! As a young actor, Kenan Thompson began his career as an entertainment reporter on Real News For Kids. Shortly after that, he came to Nickelodeon where he did the show All That as well as Kenan and Kel. Thompson made his big screen debut in D2: The Mighty Ducks before going on to do Good Burger. After that, he was able to parlay his talents into the lead role of Fat Albert, taking on the iconic Saturday morning cartoon character made famous by Bill Cosby. He then went on to appear in yet another cult sensation, Snakes on a Plane. He would continue to dip in and out of the television realm with roles on Crank Yankers and Psych. Eventually, he become a regular cast member on Saturday Night Live, with DeAndre Cole becoming one of his most revered creations. He continues to appear on SNL, where he has held down an impressive 11 year run, and is now the senior cast member. More recently, Thompson voiced the character of Greedy Smurf in both of The Smurfs Movies. Did you like this? What other then and now casts would you like us to train our word processors and web browsers on next? Let us know what you think!